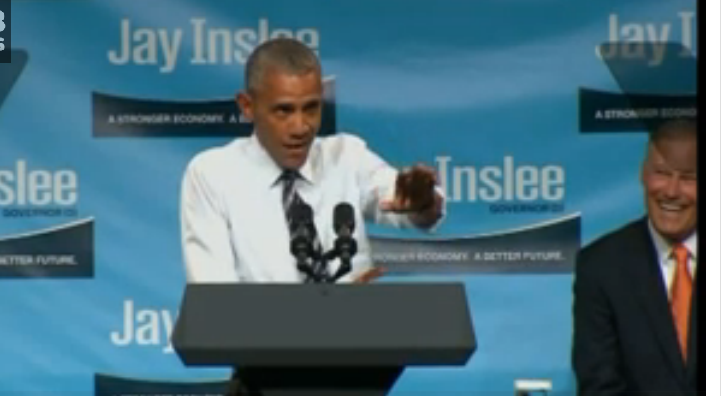 President Barack Obama was in Seattle last week to help raise funds for Gov. Jay Inslee’s reelection campaign and had his speech interrupted by activists who want the president to halt oil trains, which have become an increasingly heated issue in the Pacific Northwest following the derailment of one in a small town in Oregon earlier this month. “Mr. President, use your authority to ban oil trains now!” shouted a protester during Obama’s speech. Obama, at first, strained to hear what the topic of the shouting before responding. During the exchange, Inslee sat behind the president with a big grin on his face. That could be because the governor, according to a statement from his office, met with Sarah Feinberg, administrator of the Federal Railroad Administration, the same day to talk about the governor’s options for stopping the shipment of Bakken crude oil by rail in Washington state and hastening and improving inspections of tracks. Just last week, federal regulators faulted Union Pacific for failing to maintain its track, resulting in an oil train derailment that triggered the evacuation of Mosier, Oregon. Inslee also called on federal regulators to prevent Union Pacific from transporting oil by rail in Washington until they have more rigorous inspections of tracks. Will the ousted editor from Orange County take over the Spokesman-Review?